Barcelona is located on the northeast coast of the Mediterranean Sea and is one of the most important cities in Spain along with Madrid. The Ciudad Condal occupies a prominent role in the cultural and political aspect of Spain, a fact that can be seen by admiring its different types of buildings and historical monuments. The languages that are officially spoken are Spanish and Catalan, although because of its rich history and because it is a truly cosmopolitan site, other languages can be recognized in different corners of the city such as English, French, Portuguese, Italian. Depending on the time of year, Barcelona offers different options for those who visit it, the climate never becomes inhospitable. The Sagrada Familia is the most known and characteristic monument of Barcelona. It is the maximum exponent of modernist architecture created by Gaudí and has become the symbol of Barcelona, his visit is essential. Although not yet finished, the Sagrada Familia is an exuberant temple full of religious symbolism. Its construction began in 1882, and since its inception, the Sagrada Familia has been an expiatory temple, that is, built from donations. Gaudí died in 1926 leaving the project to finish, but thanks to the plans that are preserved, his dream seems that finally will become reality in 2026 thanks to the work of other artists and the money obtained from donations and visits. To design the interior, Gaudí was inspired by the shapes of nature and created columns shaped like a tree trunk that turn the interior of the temple into a huge stone forest. The Torre Agbar is one of the most famous skyscrapers in Barcelona, the third in the third tallest building after the Hotel Arts and the Torre Mapfre. It is located next to the Plaça de les Glòries and the renovated market of the Encantes and is one of the symbols of the Barcelona skyline. The most representative feature of this tower of 34 floors and 145 meters is its lighting. It has more than 4,500 LED lights that project different shapes and patterns as they change color. Due to its characteristics, it is easy to see it from several points of Barcelona and it has become one of its tourist icons. Undoubtedly, the best time to visit it is at nightfall, when its facade fills with color. 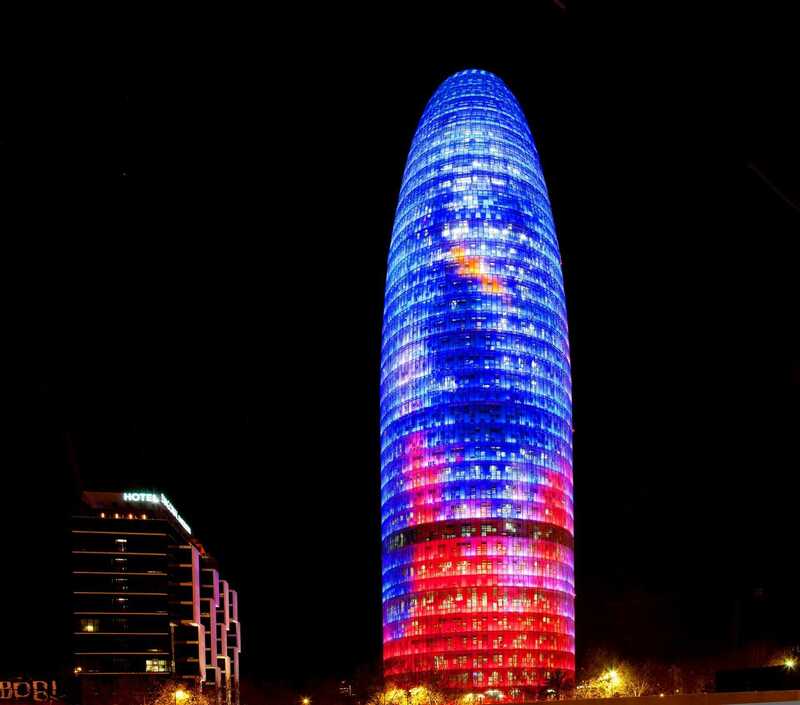 The tower belongs to Aguas de Barcelona (Agbar, hence its name), and was designed by the architect Jean Nouvel who was inspired by the rounded shape of the Montserrat mountains and the bell tower of the Sagrada Familia by Antoni Gaudí. With more than 7 centuries of existence, it is one of the oldest active markets in Europe. The commercial dynamism of Barcelona is reflected in “El Mercat dels Encants”. Throughout its history it has been located in different places, with a certain provisional air, until in 2013 it opened the doors in its current and definitive location, between Meridiana and Plaça de les Glòries. The market consists of a spectacular 24 meter roof, full of mirrors that reflect all its activity, being also a jewel of architectural design. Thanks to this, the market retains its essence and recovers the feeling of buying outdoors, while being sheltered from the rain. The best thing about the market are its stops and the auction place (where from 7 to 9 in the morning auctions of flats, stores or stocks are made). “Els Encants” receives about 150,000 visitors each week. Without a doubt, it is the best place to buy unusual items, old or new, at the best price. The Parque de la Ciudadela was for many years the only park in the city of Barcelona. It was built by Felipe V in the old grounds of the city’s fortress, to be able to dominate it after the War of Succession (XVIII). Currently, the park is one of the largest parks in the city, declared a Site of Cultural Interest and Historical Heritage of Spain. Within its grounds is the Barcelona Zoo, an amazing waterfall composed of a huge monumental complex and the building of the Castle of the Three Dragons (the Museum of Zoology). The park stands out for its large garden, with large trees and areas for walking, as well as the lake and waterfall. The lake has several islets and a variety of exotic plants and marine animals and boats can be hired. Next to the Cascade is the Romantic Garden, with a great variety of plants. And in the old plaza de armas there is an oval pond with the famous sculpture by Josep Llimona: Desconsuelo. The Cathedral of Barcelona is an example of Catalan Gothic architecture. Located in the center of the city, it was built during the 13th and 15th centuries on the old Romanesque cathedral. Originally it was going to be a Romanesque church, but it was decided that it was Gothic to attract more tourists at that time. The cathedral is also known as the Cathedral of Santa Cruz and Santa Eulalia, since in its crypt is the tomb of Eulalia, a girl who was tortured to death for defending her Christian faith (AD 340). In the cloister live 13 ocas that remember the age of Santa Eulalia when he died. The choir of the cathedral is one of the most valuable sites inside and has a spectacular carved wooden chairs. There are two other interesting places: the terrace, where you can enjoy the views of the city, and the Chapel of the Holy Christ of Lepanto, where a crucified Christ is shown to whom the Barcelonans have a special devotion. The Gothic Quarter belongs to the district of “Cuitat Vella” and is the oldest nucleus of Barcelona, as well as being its historic center. In this neighborhood most of the city’s Gothic buildings are concentrated: the church of Santa María del Mar or the church of Santa María del Pino. Many other examples of Gothic art that should be highlighted are the Cathedral of the Holy Cross, the Basilica of Mercy, the Plaça Sant Jaume, the Plaça Real or the Portal de l’Àngel. For its charm and historical importance, many cultural routes are organized to discover the secrets of Barcelona’s Gothic, which underwent many changes from the 19th century, such as the transformation of cemeteries into public squares or the demolition of the old wall. At the moment pieces of the first wall are conserved in the place of the Seo, in front of the Cathedral of Barcelona. Las Ramblas is the most emblematic walk of Barcelona. Part of Plaza Cataluña and flows into the port, where the statue of Christopher Columbus is. Las Ramblas consists of several sections, hence its name in the plural. They emphasize the Rambla de Canaletas, for the well-known fountain where the titles of the Soccer Club Barcelona are celebrated, and the Rambla de las Flores. Besides flower stalls, there are kiosks, souvenir shops, a handicraft market and numerous bars and terraces. Many artists come together: living statues, musicians, dancers and artists of all kinds. If you want to make a portrait at the moment, this is the right place! Passing through it you can see several buildings of interest such as the famous Mercado de la Boquería and the Teatro del Liceo. Highlights the design of its tiles, which mimic the waves of the sea, in addition to the magnificent work of the artist Joan Miró on the pavement, halfway through the walk, which symbolizes the entry by sea to Barcelona.